My characters used Casandalee to takeover one of Ghartone’s Battleguards and turned it against him. It survived and has become Casandalee’s host. The blue items show the bonuses/changes from the AI over and above the base robot. Gift of the Machine God. As a creature of technology Gearsman Mk III gains many damage and condition resistances and immunities but they are also susceptible to lightening attacks. Adaptive Learning. A gearsman can automatically gain skills, proficient and feats as needed though it can only have one new ability active at any given time. Charge Weapon. Any metal melee weapon wielded by a gearsman becomes charged with lightening and deals +1 die of lightening damage on a hit. Combat Hardened. The gearsman’s advanced robotic frame provides a measure of protection against attacks. The Mk III has a damage threshold of 10. It reduces all damage by ten. Discipline. This memory facet bolsters an AI’s thought and personality with rigid order and behavior, granting it a +2 enhancement bonus to its Intelligence score. In addition, the facet grants the AI the ability to bolster the programming of any robot within 30 feet as a bonus action for 1 minute per day. A bolstered robot gains advantage on attack rolls, +2 weapon damage rolls, and advantage on Wisdom saving throws. The AI can target an aggregate under its control with this effect. This adds the Lawful attribute to the AI’s alignment. Overcharge Energy Weapon. Any energy weapon wielded by a gearsman mk. III can be overcharged at the cost of 1 extra charge per extra die increase. Self-Repair (Recharges after Long Rest). 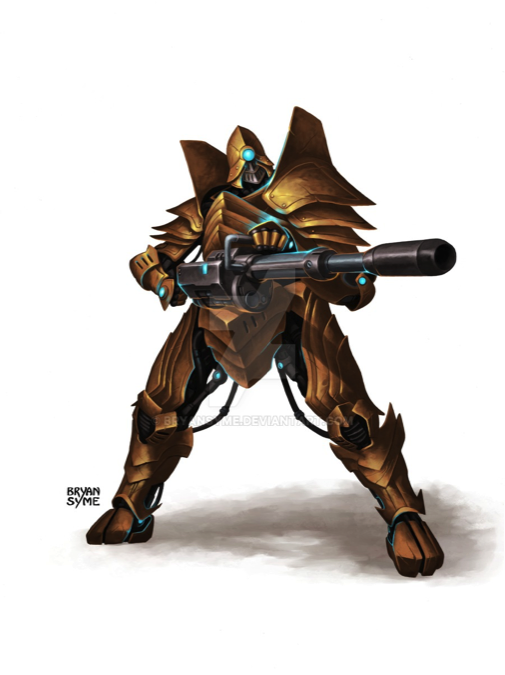 A gearsman’s nanites heal it of damage at the rate of a number of hit points per hour equal to its Hit Dice (12 hit points per hour for most gearsmen mk III). Up to once per day, as an action, it can heal any robot it touches of 4d6 points of damage—if a gearsman uses this ability on itself, it automatically heals itself of the maximum amount of damage: 24 points. Multiattack. The gearsman can makes two melee or one rocket launcher attack. Rocket Launcher. Range Weapon Attack: +10 to hit, range 120 ft.; multiple target in a 30 ft. sphere. Hit: 37 (10d6 +7) bludgeoning and fire damage, DC 15 Dexterity save for half damage except creatures hit directly. Stun Baton. Melee Weapon Attack: +10 to hit, reach 10 ft.; one target. Hit: 15 (2d8 +7) bludgeoning and lighting damage. At the battleguard’s discretion the lightning damage maybe disabled. On a critical hit the creature must make a DC against the amount of damage caused Constitution save or be stunned for 1 minute. Machine Slam. Melee Natural Weapon Attack: +10 to hit, reach 10 ft.; one target. Hit: 25 (3d12 +7) bludgeoning damage. Implacable. When a Mark III gearsman drops to 0 hit points for the first time it regains 15 hit points and fights on. Gearsman can use weapons and other items as a human so it is not uncommon to find them carrying weapons, in particular crowd control type weapons. The battleguard is tasked with protecting Starfall so also carries lethal weapons including a rocket launcher (5 charges) as well as non-lethal weaponry like a stun baton and 3 soft grenades (15 (5d6) sonic damage and this damage never kills. DC 15 Dexterity save for half). This hulking humanoid robot was recovered by the Lord-Captain of Divinity and used to supplement his security force. Though the Technic League call them gearsmen, Drub knew them for what they really were – The Iron Men from the Dark Age of Technology. They appear as coppered burnished armoured men though time has corroded many of them so they appear almost rust coloured. They were loyal servitors to the Captain until the attack on the ship caused Unity 2.0 to go insane and ordered them to exterminate or biological life on the ship.